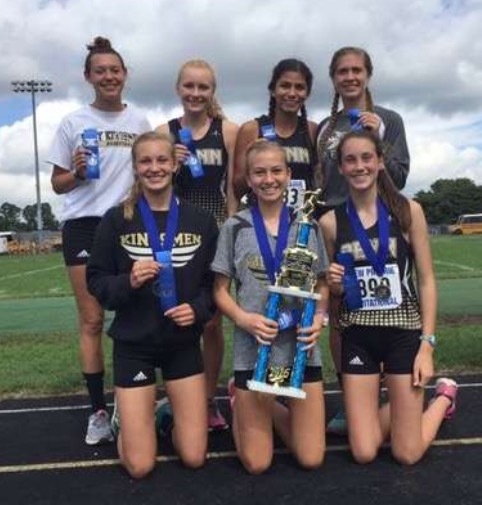 Penn’s Girls Cross Country team raced to the team championship of the prestigious New Prairie Invitational title on Saturday, Sept. 17. The Kingsmen boys team placed ninth. Lauren Frank led Penn’s blue-ribbon showing with a fifth-place finish. She ran the muddy course in a time of 18:51. Emma Jankowski placed 10th in 19:40. Ellie Jankowski took 13th place in 19:42, followed by Lorena Daugherty (27th in 20:04), and Dani Spring (38th in 20:23). Jonathan Harley led the Penn Boys Cross Country team with a 14th-place finish in 16:33. Following Harley were Matt Long (59th in 17:27), Nick Scheel (64th in 17:34), Chad Piatt (69th in 17:36) and Curtis Cornell (73rd in 17:40).